I grabbed the nearest tea towel to scrub my tongue then back to swishing and spitting, my head under the kitchen faucet in a sink full of dishes. My body was telling me, way to go you’ve hit the eject button, get ready to hurl. As I recall this story to my teenage daughter she bursts out laughing. I can’t blame her but I scowl back, “We need a plan to deal with leftovers in this house. We’re wasting too much food”. Turns out the leftover coconut milk from a recipe she made was in the fridge far too long. I hastily tasted it before adding it to my carrot-ginger soup. It’s great my kids like to cook but how am I suppose to keep track of how long leftovers have be lying around? For the most savings, curb food waste. Households accounts for 47% of food waste, estimated to be about $30 a week per family. That’s like dumping one or two bag of groceries into the garbage on the way out of the store. Solution: To get everyone on side, come up with solutions as a family. Make it work: Our solution is for everyone to manage their own leftover bits. Tell others there’s some coconut milk in the fridge that needs to get used up, make a plan to use it up yourself or freeze it. Not sure how to store food or for how long? Check out www.still tasty.com. If your kids need a nudge, try this. Give your child $10 to put into the family trip jar every week your family follows through on the plan. Research out of the Cornell University Food and Brand lab found the top cause of food waste to be buying too much. Solution: Check what you have on hand before shopping. Plan meals based on what needs to get used up first (another way to curb food waste). Check what’s on sale and use that to fill the gaps to make meals you love. Make it work: We have a bag of unused carrots leftover from last week and stewing beef is on sale, so we’ll make stew this week. 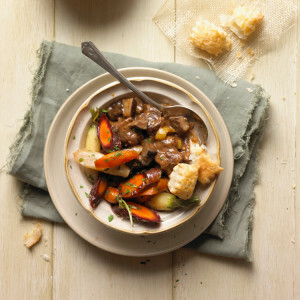 Try: Beef and Mushroom Stew with Glazed Carrots and Puffed Pastry Croutons. Buy whole food closest to its natural state. Research proves what we all know to be true, calories from ultra-processed food like pop, cookies and pre-prepared food has more than doubled. We spend too much on food that is not all that good for us. Solution: I’m not going to say make everything from scratch or never buy chips but decide on the highly processed foods you often buy and can live without or cut back on. Make it work: We’ve managed to stop buying processed deli meats. We are eating better and saving a bundle. We make egg or salmon salad, use hummus or cook extra meats to make our own unprocessed lunch meats. Buy produce in season and use frozen or canned at other times. This week at my local grocery store, 2 pounds of carrots (in season) are on sale for 88 cents while cauliflower (not in season) was $7 a head. I can wait for cauliflower to come in season again or buy frozen, thank you very much! Solution: Fresh local food has not travelled far which is why it often tastes best and is priced right. Search recipe databases using ingredients that are in season. 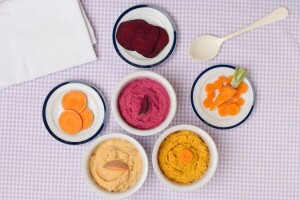 Make it work: Use up leftover seasonal winter vegetables like carrots, beets and sweet potato by adding them to your favourite hummus recipe. Did you know? Research shows more fruit will be eaten and less is wasted when you cut up fruit for kids. They like it better than whole fruit because it’s easier and tidier to eat. Sprinkle apple slices with cinnamon to keep them from browning. 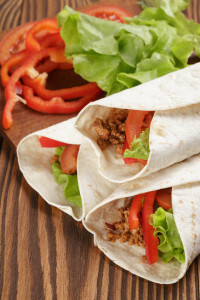 If you love to include meat in your weekly line up but are feeling the pinch with rising meat costs, extend your meat with pulses and vegetables. Expect pulses (dried peas, beans, lentils, chickpeas) to become a household name now that the UN has declared 2016 International Year of the Pulses. Solution: If your family is new to eating pulses, start by adding them to foods you love. 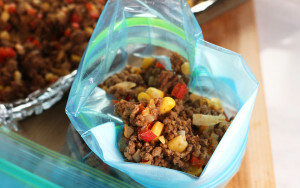 Make it work: Add a can of lentils (or two) to this Big Batch Tex Mex Beef. Use it in pasta sauce, tacos, wraps or as a pizza topping. Get the kids on side sooner by inviting them to it cook with you. 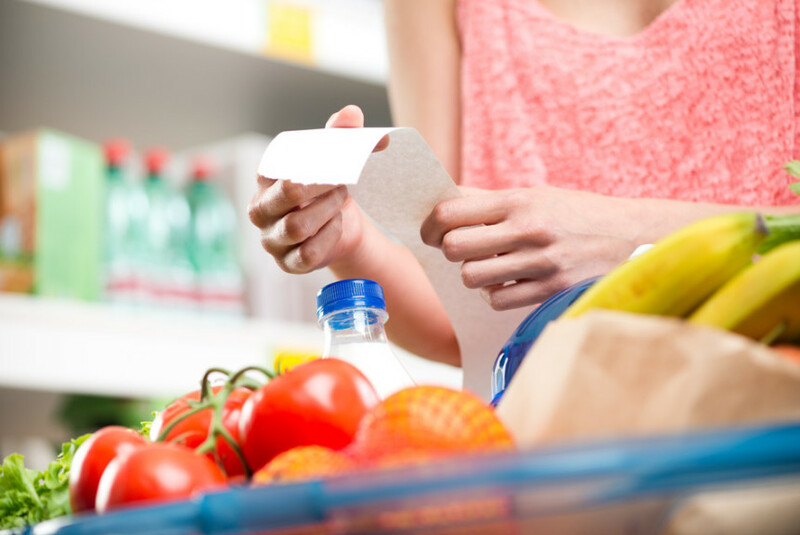 What tips for success can you share for eating well on a budget?